I am looking for the most heat tolerant runner pole bean. Would it be better to grow them in the fall,since I live in Northeast Texas? Insuk Wang Kong. Yes, it would be better in the fall as It's a little late to plant now. Christina, I had the best luck with Scarlet Runner beans, but many different ones did well for me. I don't know about planting them in the fall, because I never tried it. Painted Lady grew well with beautiful flowers, but didn't produce a lot. Insuk Wang Kong did very well. Where can I get the seeds for the Insuk Wang Kong? Any special way to cook them? When did you plant yours? I wish I could answer that first question for you. I got mine from a lady who participated in the beans part of Tormato's MMMM swap years ago. They cross as bad as pepper and okra plants do - so getting the real thing might be difficult. I didn't find a site selling them. Any recipes for using them? I wonder if they can well? Just curious, has anyone tried shade cloth? Here in NC, I have only been successful with an early crop sown in April/May for a June Harvest, and a crop sown later for a Fall Harvest. Matter of fact last year, right before Thanksgiving I had a small mountain of Ky Wonder. The other bean plantings that I kept sowing either wouldnt even sprout, or would fizzle out and produce nothing. Really considering 30-40% shade cloth. The 50% on my Salad Mix is working wonders. Perhaps some confusion... are you referring to runner beans (such as Scarlet Runner), or to common pole "green beans"? How will the beans be used, as snaps, shellies, or dry? True runner beans (including Insuk's Wang Kong) do poorly in heat; they might flower, but not form pods unless/until conditions cool. They are good for snap beans in areas too cool for regular beans to do well... and the very large seeds are also a good cool-weather lima substitute. You might be able to plant them late, so that pods set in cooler Fall weather. But if what you want is just some snap beans, then I concur with the recommendation for the pole bean Rattlesnake. Hmmm... you live in a challenging climate for runner beans. I have several that you could try (including Insuk's Wang Kong), but it would be helpful to know how you intend to use them. All could be used as snaps; good sweet flavor, but meatier than regular snaps, and need to be picked very young. If you would like to try any of these, send me a PM with your address, and I'll send you some seed. This season I'm trying Tennessee Green Pod for the first time. It was listed as a 50 day bush bean but I soon noticed what looked like vines starting. I did some internet sleuthing and came across something that said that this bean "has semi-runner tendencies". That caused me to put a piece of fencing behind them and sure as shootin' they're climbing it. It will be interesting to see how far they "run". It's now 26 days from germination and they're flowering. If this really is a runner bean and takes the heat, I'll let you know. They just might finish before the real heat sets in though, so I might plant more in another bed for a later finish to test heat tolerance. Last edited by GoDawgs; May 29, 2018 at 09:44 AM. Reason: Oops! Put the wrong company link! 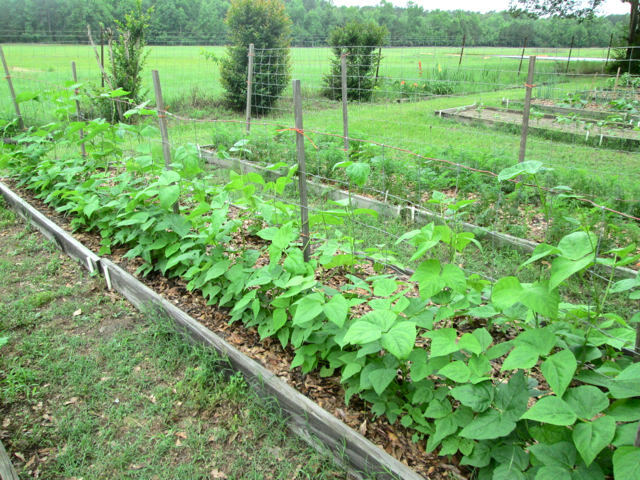 Here's a photo of those Tennessee Green Pods, a "bush bean" but with runner tendencies. That's a 40" tall piece of fence I had to put behind them. "Highly recommended for hot, dry growing conditions. When other beans burn under extreme heat, the Tennessee Green Pod continues to produce a large, vigorous crop of 6" to 7", medium-dark green string beans." I bought them to try as I was also looking for heat tolerance. They are a 50 day bean. It's been a cooler and wetter May than normal so yesterday I planted another 18' row to see how they do in June heat. Might also try some in the fall along with the Contenders if they bear well. Last edited by GoDawgs; May 30, 2018 at 10:30 AM. those Greek gigantic beans have begun to bloom. I broke one flower and tried to know where the pistil is and where the pollen is. I did not succeed. I do not know if I would be able to hand-pollinate them.